The 2018 Equestrian Canada (EC) Convention kicked off on Friday, April 6 at the Brookstreet Hotel in Ottawa, ON with a full day of interactive learning opportunities, exceptional speakers and exciting social events. The day began with the Rise & Shine Welcome Breakfast, where delegates were invited to enjoy a meal with the EC Senior Leadership while gaining an inside look at what EC has achieved to date during the first six months of the current Board of Directors’ term (Phase I), and what they plan to achieve moving forward (Phase II). EC President, Meg Krueger led the session and was joined by presenters, Vice President, Rupert May and Governance Chair, Charles Cue. In addition, Krueger introduced newly appointed EC CEO, Richard Mongeau, who provided a welcome address to delegates. Krueger opened by speaking to the current state of EC and the Canadian equestrian industry, and the vital need to encourage youth to engage at the governance level. Stabilizing EC operations and hiring a Chief Executive Officer. Bringing financial reporting up to date and approving the 2018 budget. Increasing communication through 100+ meetings with a wide range of stakeholders, and consistent digital communications. Strengthening international relationships through EC Board representation at events, such as the FEI General Assembly, to promote and represent Canada in major discussions involving rule changes, disciplines, and more. Creating a Service Agreement Committee to strengthen collaboration and partnership with Provincial and Territorial Sport Organizations (PTSOs). Collaborating with PTSOs on a Coaching and Athlete Development Plan for a coaching and grassroots development pathway. EC committed to nearly $500,000 in funding through a multi-year plan, with $37,500 already in process and $175,000 approved in the 2018 budget. CEO on-boarding support for a seamless and complete transition. An organizational efficiency review by the CEO. Request for Proposal process for an integrated membership, event sanctioning and national standings system. Final preparation for the 2018 FEI World Equestrian Games. The educational opportunities on opening day of the EC Convention included the Concussions & Return-to-Play panel, which facilitated an engaging discussion concerning education, awareness and enforcement of EC’s Concussion & Return-to-Play protocol, implemented in 2017. Moderator and Senior Coaching Consultant from the Coaching Association of Canada, Wayne Parro, began the session by encouraging audience interaction to capitalize on the knowledge of industry experts present. The panel was comprised of Dr. Elisabeth Hobden, Canadian Equestrian Team (CET) Physician; Stephanie Cowle, Parachute Canada Solutions Project Manager; Anne Welch, FEI 2* and EC Senior Steward; and Jennifer Eastwood, EC Interim Director of Technical Development. Dr. Hobden and Cowle provided valuable insight into concussion research and care, while Eastwood and Welch shed light on EC’s concussion initiatives and internationally-lauded Return-to-Play protocol. For more information on EC’s Return-to-Play protocol, visit here. EC was honoured to host Canadian Eventing Olympian and author, Claire Smith, at the 2018 Convention. After suffering a traumatic brain injury at the 1997 Burghley Open European Three-Day Event Championships. She wrote about her healing experience and the identity reconstruction that followed in her new memoir, Falling into Now: Memories of Sport, Traumatic Brain Injury, and Education. Smith went on to explain how, despite her reservations, she has been able to reconcile and eventually transcend her all-consuming equestrian identity and construct a more positive, comprehensive sense of self. Click here for more information on Claire’s story, and to find out how to purchase her memoir. Always a highly popular presenter, Dr. Hilary M. Clayton, BVMS, PhD, Dipl ACVSMR, MRCVS returned to the EC Convention in 2018 to discuss the scientific effects of the rider and saddle on creating a comfortable, safe ride for the horse. Dr. Clayton walked the rapt audience through her cutting-edge research, illustrating the variety of factors that can affect how saddles distribute pressure on a horse’s back. 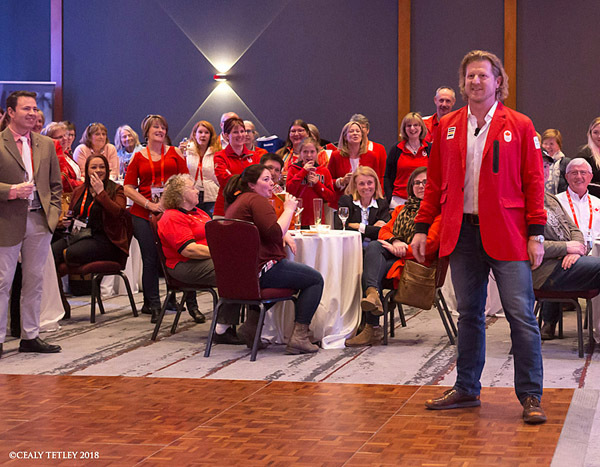 Day one of the 2018 EC Convention concluded with the #RideToTryon Red & White Social Event in support of the CET’s journey to the 2018 FEI World Equestrian Games (WEG). Four-time Canadian Olympian, Curt Harnett provided a rousing and entertaining keynote address. He spoke to the power of sport and how his innate passion for cycling carried him through the highs and lows of his cycling career, culminating in his bronze medal performance at the 1996 Atlanta Olympics. Harnett’s inspiring story concluded with a call to the Canadian equestrian community to come together as a unified force in advance of WEG 2018. And that community is one that is close to Harnett’s heart. As the husband of EC Dressage Committee Chair, Victoria Winter, Harnett has spent plenty of time within the horse world. “You are all custodians of your sport and you are blessed with the opportunity to make it the best sport in Canada,” said Harnett. “We all have a passion for the horse and the opportunity starts here. We have Tryon later this year, an event that happens every four years that brings the equestrian community together. I encourage you to begin today to support those athletes who will be donning the maple leaf in your honour mid-September in North Carolina. Visit EC’s Facebook page to enjoy Curt’s full keynote address.